In between pressing February deadlines and a record-breaking snowfall yesterday, I managed to spend some time with Random Number friends Darren Jones and Ryan Roa. 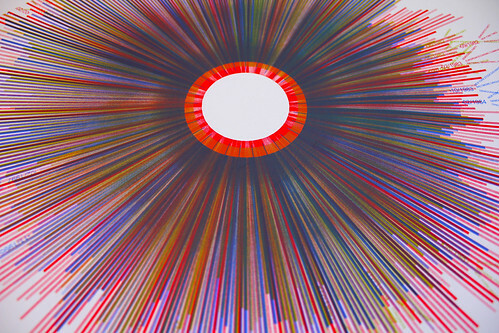 Through his Phenomena Project, Jones is curating an interesting program for the Trinity Wall Street Church by responding with a series of exhibitions to the church’s 2011 theme of “reading the scriptures through other eyes”. Not an easy task, especially for a self-proclaimed atheist. In the current show, Ryan Roa contributes the kind of poetic and conceptually-driven installation that has come to define his body of work. 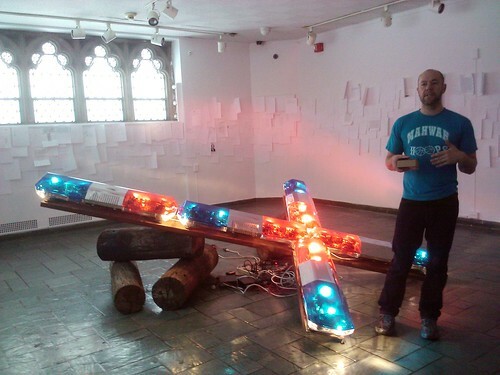 Inside the small museum of Trinity Church, Roa has placed Re-form, a sculpture made of flashing emergency lights supported by a cleaved telephone pole, which recalls a downward pointing version of the cross of St. Peter. On the walls surrounding the sculpture are various hand-written and typed notes left by visitors as they consider the issues set forward through the exhibition and the church’s annual theme. These public communiques will be collected and presented in book format at the close of the exhibition. There is an effortless connection between the communicative power of Roa’s materials and the various levels of expression in the visitors’ notes. In February I’ll be adding art print publishing to the growing list of Random Number services. This new division, aptly titled Random Number Multiples, will offer a curated selection of limited edition artworks. 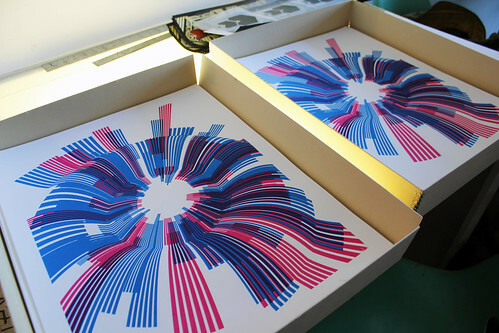 Random Number Multiples will launch with two silk screen print editions by Jer Thorp and two by Marius Watz. The exciting part about these prints is that Thorp and Watz, who mainly use software as their medium, are embracing a technique that allows their hand to be so evident. All of the images in this post come from a weekend of silk screening at the Bushwick Print Lab, under the guidance of founder Ray Cross. The four different prints are editions of 50, and are available exclusively through Random Number for $100 each. The online store launches the first week of February and we will celebrate with an exhibition showcasing both artists’ work on February 11 in Brooklyn. 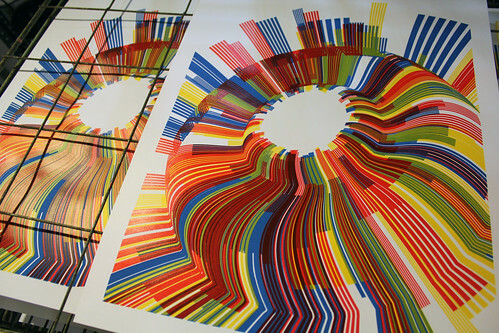 It will be a great opportunity to see the screen prints framed and in person if you’re in the NY area. Details to follow shortly, but pre-orders can be placed by contacting info@randomnumber.nu. 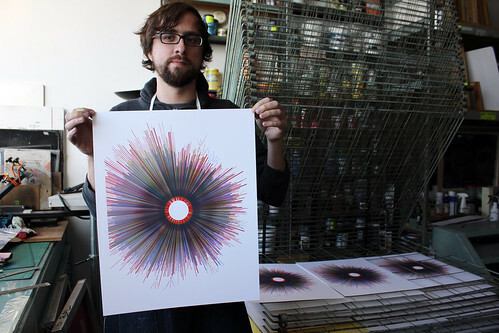 Click here to see more artwork details and photos from the printing process. I am working on a new exhibition for Flux Factory and we are accepting proposals through an open call process. Send in your proposals no later than JANUARY 19 to my Flux Factory email address (posted below). Flux Factory, an open art collective that provides contexts for artists to create new work and actively promotes a community of diverse cultural producers, is currently accepting proposals for an exhibition that focuses on objects of war and occupation. Armed conflict leads to unique forms of expression that pervade contemporary culture in myriad ways both visible and invisible, tangible and abstract. For this exhibition we are inviting artists to respond to one of five cultural by-products or expressions of war that have been chosen for their symbolic value and relevance to daily life. They include: (1) Transcript of the Milosevic war crimes trial at The Hague, (2) the balaclava face mask, adopted as a symbol of the Zapatista Army of National Liberation, (3) US Army recruitment video game, (4) Save Darfur Coalition full-page ad in New York Times, and (5) North Korean Hell March video and the ensuing discussion posted on YouTube. We invite you to respond to one of these objects or images in any way you wish. There is no limitation to medium, and a small honorarium will be available for selected proposals. We will also feature a panel discussion and produce an accompanying catalogue of the exhibition. This show, organized by Douglas Paulson, Chen Tamir, Ginger Shulick, and Christina Vassallo, is an extension of a previous exhibition by Tamir, “One After Another,” in which 8 artists were asked to respond to a photojournalist’s image of Palestinian prisoners being led blindfolded and handcuffed to an Israeli military base near the Gaza Strip. You can read more about “One After Another,” which was presented in 2009 at the National Gallery of Saskatchewan, here. Or 5 minutes of video. Please do not send movie files. Instead, include a link to your work online in the proposal paragraph. The deadline for submissions is Wednesday, January 19. Please use “War Show Proposal” as the subject of your email, and remember to add your name to all materials. Do not send original material. Send submissions to christina[at]fluxfactory[dot]org. If you have any questions, please email with “War Show Question” in the subject line. We’re looking forward to your proposals! The Myrtle Avenue Brooklyn Partnership is at it again. They just announced their third annual Myrtle Holiday Windows Contest, in which artists can submit display designs related to the “winter wonderland” theme for participating stores along the avenue in the Fort Greene/Clinton Hill area. Applications are due NOVEMBER 11, and you can find the official form here. Below is a photo of last year’s 2nd place winner, Katie Huffman, who cleverly worked around the framing grid for her Winter Solstice scene. Any discussion of artist-designed Brooklyn storefront windows wouldn’t be complete without a nod to the inspired displays at Desert Island, the fascinatingly geeky comics shop on Metropolitan Ave in Williamsburg. The owners have showcased mostly female artists in their window displays, and have even opened their storefront to a kids art program. The striking arrangements include scale models of redbird subway trains made of cardboard, the psychedelic displays of Ali Aschman, a natural history museum-type display by Sherri Hay & Raphael Leon, and James Moore’s glowing stalagmite that is currently on display. Participating in the Dumbo Arts Festival with the group exhibition Collective Consumption was a blast! The festival and the exhibition had a great turnout. The Collective Consumption opening was especially memorable–all due to milk & cookies, a live sound performance, and spilled paint. Thanks to all who stopped by 20 Jay Street #1019 to see the show.